How Does Yoga, a Self-Regulating Practice, Regulate itself as an Industry? You are here: Home / Yoga Articles / Teaching • The Business of Yoga / The Business of Yoga / How Does Yoga, a Self-Regulating Practice, Regulate itself as an Industry? 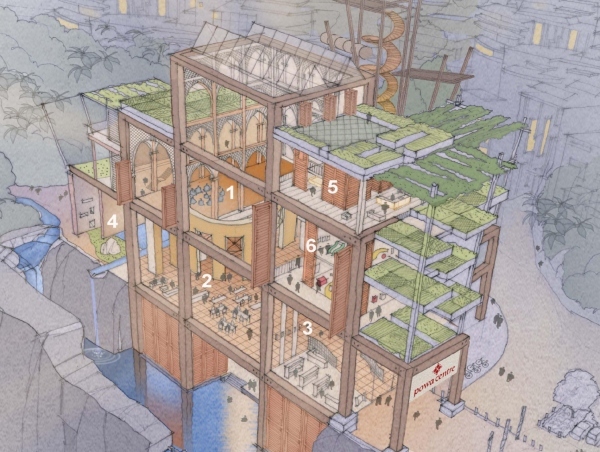 A vision for The Powa Centre, an ecologically-driven complex which houses a range of financially sustainable, cross-pollinating businesses all under one roof. Within Powa Centre, busy individuals can access a variety of activities, services and products to empower them, engage them with their spiritual side, strengthen the community and ultimately the planet. The advantage of growing up in the alternative health realms is that I’ve seen the evolution of these arts & sciences over a number of decades. My mother was doing yoga while I was in the womb & a few years later she became a massage therapist. When she worked in a health food store, I would hang out in the back. When we were Buddhist we chanted and had an altar in our home. Our family heritage to the pre-colonized Powhatan “Indians” of what’s now known as Virginia added to our hippie interest in all things “back to nature”. As a creative, I didn’t suspect the most intensive training & career I would invest in would be yoga, but it turns out this apple did not fall far from the tree. So I’ve seen the growth of yoga, so-called spirituality, health food, & alternative wellness practices in a number of countries over a number of decades. When I arrived in New Zealand in 2005, there was barely any mainstream recognition of the growing yoga world, or where it seemed to be heading. What I also saw in those first years of living in NZ was that there was no regulation on teacher training; there were no industry standards. This didn’t bother me, for two reasons. One, I’d been doing yoga since I was young & I knew that my professional credentials were covered by my teacher training in 2002 & my US Yoga Alliance registration since 2003. Two, yoga has all-ways been a practice of direct revelation for me so while #1 is true, I also value keeping yoga regulation an internal process as much, if not more, than one governed solely by outside “experts”. What we have here, in this time & place, is the opportunity to learn from how others in the US, Europe & Australia have created industry standards that continue to evolve with the changing industry. The Hauora conference & the creation of Yoga Alliance New Zealand in recent years are current signs that we are in the middle of clarifying what yoga has been, is now, & could be. Nearly 8 years ago, a vision that had been percolating in my consciousness for years condensed into words & images I could share with others. While I was holding down the fort of my Wellington studio, Powa Centre, I presented the bigger iteration of it for a business fund. 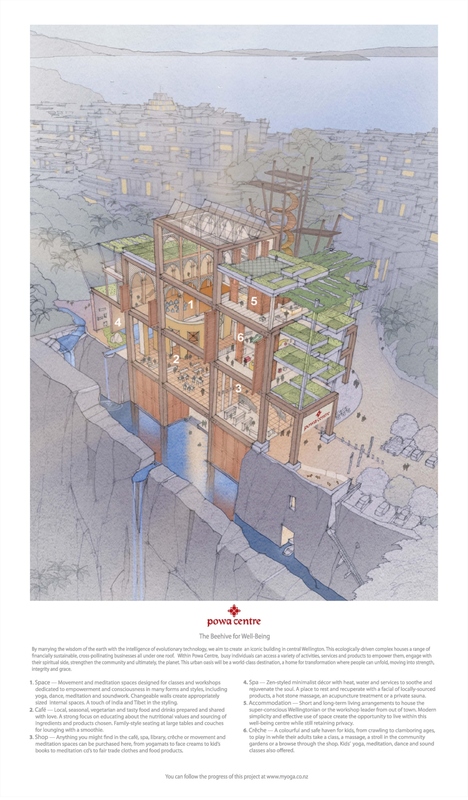 Powa Centre was a finalist, but didn’t win the support it needed to actualize a multi-million dollar self-sustaining living building & wellness complex. Go figure! Only two years prior, while taking on the commitment to the Marion Street commercial lease, I asked Kiwibank for a business credit card or overdraft to support MYOGA as I developed it in a nascent market & during the recession! They questioned whether yoga was really a viable business & I brazenly told them that they would soon see. And only 5 years prior to that, when I first landed in NZ, I was startled to be asked by more than one person whether yoga was a cult. What I saw, when the vision I had for Powa Centre was refused, was that more individuation would be needed first. Tink Stephenson, who shared a very similar vision, & I made an audio recording to evoke the feelings of the space we envisioned. We wanted people to see it for themselves, without locking it into existing technologies or structures. But we also had our vision board of inspirations & the architectural sketch I had commissioned for the funding competition. Aside from the wonderment over how to fund such a vast & expensive vision, everyone’s response was that they wanted to BE in such a place–they wanted it to already exist. What I mean by saying that more individuation was needed, is that it seemed pretty apparent to me in 2010 that each yoga teacher needed to establish their own style & brand & studio, before any clear & effective collaboration could happen. Powa Centre was my answer to the ridiculous reality of each person trying to manage all the logistics alone–maintaining the physical space & paying for it, developing & maintaining the style & particular brand for the chosen style & then implementing that in all forms of promotion, managing the finances & the teachers or staff, cultivating student relationships, keeping up with training, and on & on & on. The Powa Centre was modeled on places like Kripalu Center, Esalen & Omega in the US. These places hold to a clear ethos which allows for all the many streams flowing to the sea, to share their individual expression of that central ethos. The physical spaces are neutral enough that a group can come in & make it their own without having to own the space, or, more likely, be owned by it. Only 12 years ago the NZ community included people who still thought yoga was a cult. About five years ago there was an upsurge of teacher trainings & then suddenly we had a “Yoga Industry”. I became so wary of this trend that I took myself on sabbatical to consider what it might mean overall & how I might continue to play a part somewhere along the line. For while the increase of yoga visibility was great for all those who wanted to up-level their practice & could do so through a 200 hour training, it was not necessarily so great for the general populace whose first exposure to yoga was from a first-time teacher. Much of my work early on in NZ was educating people about what yoga really is. I want to stop here for a second & pay homage to all those, known & unknown, who have put in the hard yards to pioneer yoga here in Aotearoa. Without them we wouldn’t be here now. I am such a huge advocate of the Basics of yoga that this is what I’m sharing with folks at Hauora–The Challenge of the Simple. I’ve all-ways loved working with people who are new to the field by demystifying it, making it accessible, while at the same time slipping in the metaphors & teachings as best I could. These days I’m not so sure the general population are all that much more educated on what yoga is or could be, as that’s a big topic & involves more than a few gym-yoga classes, but at least there’s a wider receptivity to it as a practice. I was astounded recently, while teaching in a corporate environment, to have far more folks in the yoga class than the pilates one. That was another sign that yoga has become accepted enough for people to feel it’s more popular than frightening, though it still remains more firmly rooted in the realms of the privileged, which is why I’m holding a discussion at Hauora on Social Enter-Prize-ing Yoga. Now what we face is teasing out what is “good” yoga, which is obviously subjective. Yet if we’re all looking to agree on industry standards of what is good yoga, then how do we come to collaborate on & agree with that vision? What have we learned in our individuation–in our pursuit of the style, brand, studio that sets us apart? What ties, or yokes, us together beyond our need to differentiate? Although frustrating to me at the time, since I dearly wanted to exist within such a world as the vision I had of the Powa Centre, it was also just plain clear. We’re in a natural progression from the individuation & stabilization at Muladhara chakra to the relational at Svadisthana. If we haven’t clarified who or what we are, merger is a mess. These things can’t be rushed. It is only now that enough people have been practicing & teaching & growing in this realm long enough that we can have the deeper conversations on a wider scale. So here we all are–a hell of a lot more friends! Such fun to be having these conversations now, to be sharing the field with all those who will be present at Hauora. What is yoga? What is good yoga? What is good training for good yoga? What is good, commensurate pay for good teaching? What constitutes good teaching? Should yoga be a service & not be charged? How do the yamas & niyamas translate into studio ethics & influence relationship dynamics? Can anyone “own” the practices? These and so, so many more inquiries. Join Melissa Billington and other yoga experts at the Hauora Yoga Conference, a three-day educational event where the professional yoga community in Aotearoa New Zealand connect, discuss, learn, innovate and practice together. Educate yourself, practice yoga and be part of national discussions with our selection of Clinics, Masterclasses, Workshops, Discussion Panels, Keynote Speakers and more! Melissa Billington’s hippie parents introduced her to yoga while still in the womb. At 6 she went to Kripalu Ashram, at 16 she began Kundalini Yoga and, after leaving the US in 1999 to roam India, she returned to Kripalu for her 200 hour certification in 2002. Although privileged to teach in a number of countries, Aotearoa New Zealand is where she’s lived the longest (since 2005) and feels the most at home. 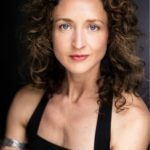 In 2008 she opened Powa Centre in Wellington and organized her teachings as MYOGA—freedom to unfold, with the aim to empower others to empower themselves. Melissa has certifications in Pregnancy Yoga, Radiant Child, Forrest Yoga Advanced, and has been an ERYT with the Yoga Alliance since 2004. She formulated and led two 200 hour teacher trainings, taught on TVNZ’s Good Morning Show, and in the local women’s prison, for two years. In 2014 she put her teachings online and in 2015 she took a “spiritual sabbatical” to question the Yoga Industry, and to write a memoir for her Seasons teachings. On walkabout, Melissa connected deeply to the welfare of water, women, animals, trees and children, which has led to the next up-leveling of MYOGA–The Amazon Academy–launching soon!